The beacon atop City Hall was located and restored a few years back and placed where it belong. It sweeps the sky at night, offering a Gothom City-type effect. Sorry the photo is blurry; I must have been excited by the cool sight. I had read an article about this beacon’s planned restoration in 2001, just before 9/11. As I recall, it was only going to operate at certain, specified times. When the 9/11 tragedy hit, I already had tickets for an event at the Music Center, and I went with a very heavy heart, a week or two after that awful morning. 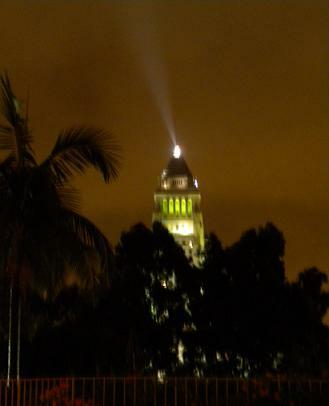 At any rate, after we left the restaurant at the Music Center (it was a Saturday night), I looked toward the City Hall, and the beacon was flashing. I could not hear a wail, but I felt like that light was wailing for us all. Speaking of beacons, I heard a rumor that there are plans to install a “cyber-columnist” beacon atop Mt. Baldy in order to summon a scribe when scribe-worthy events occur in the 909. From what I’ve heard, the beacon will be Batman-like, but instead of big ol’ bat in the sky, IE residents will see what appears to be a keyboard surrounded by a swarm of gnats. Best wishes to all for a greatly improved New Year.